It’s tempting to think of sacred tombs and ancient monuments as our best window into other cultures. But archaeologists have long known that if you really want to understand a civilization, to know its people’s passions, weaknesses, and daily rituals, look no further than their garbage. Robin Nagle has spent much of her life fascinated by trash, and its oft-unseen impacts on our society, our environment, and our health. Nagle’s recent book, “Picking Up,” chronicles a decade working with the New York City Department of Sanitation, years spent in their offices, transfer stations, locker rooms, and of course, their garbage trucks. Interspersed with Nagle’s personal experiences are enlightening tidbits from the city’s long and difficult history of trash collection. As Nagle points out, we live in cities literally built on trash, yet the management of household waste remains one of the most invisible aspects of modern existence. In the U.S., the most wasteful country per capita, each citizen throws away an average of 7.1 pounds per day, according to garbage guru Edward Humes. So what place could be better to study the impact of this onslaught than New York City, which generates nearly 22 million pounds of household waste every day? Nagle’s research covers all the complexities of our sanitation situation, from landfill archaeology to the integration of women in a male-dominated profession. One of Nagle’s most disturbing revelations is that a career in sanitation is more dangerous than working for the fire or police department, despite a clear absence of public appreciation for our garbage men and women. 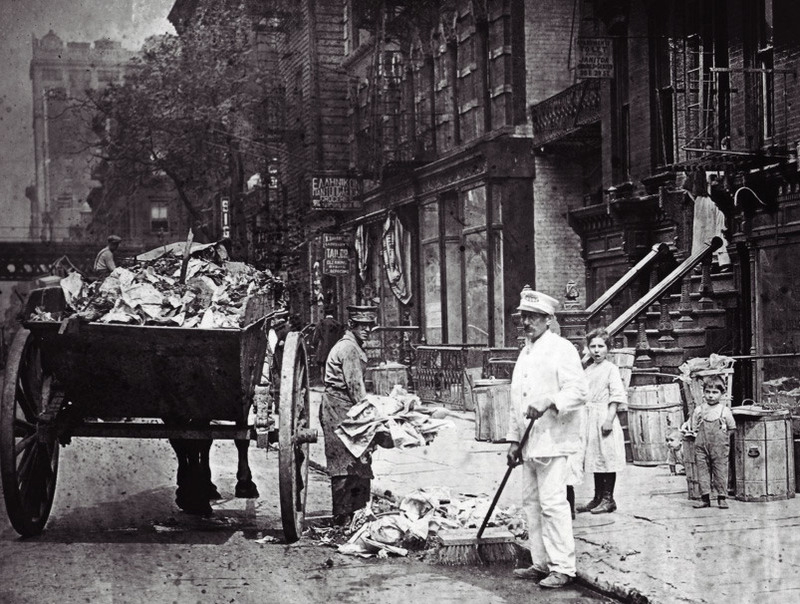 Top: An early image of the sanitation department collecting trash, circa late 1890s. Photo courtesy DSNY. 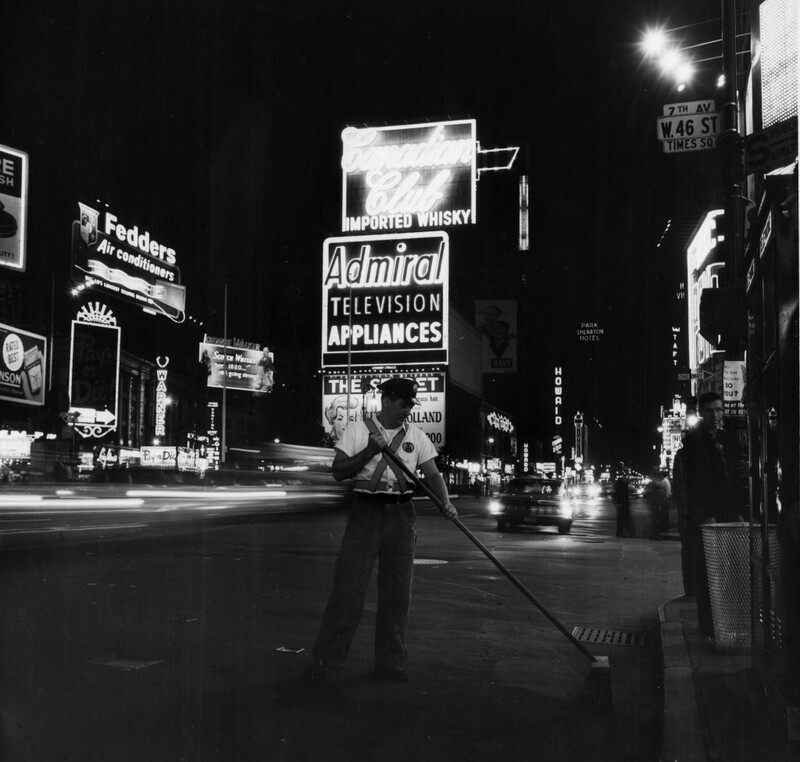 Above: A street sweeper, or “San Man,” in Midtown Manhattan in 1964. Via National Geographic. Now that the book is finished, Nagle is working to document the field’s oral history and develop a Museum of Sanitation. Part of Nagle’s motivation is to restore the dignity of the profession and remind urban dwellers that they couldn’t function without a sanitation department. We recently spoke with Nagle about the hidden life of trash and the complicated business of managing it. Collectors Weekly: What initially drew you to the world of trash? Robin Nagle: My dad and I were camping in the Adirondacks, and for people who are not familiar with the East Coast, the Adirondacks are 6.2 million acres of the last untrammeled wilderness on the East Coast, outside of some parts of Maine. It’s the last place east of the Mississippi where you can be five miles from a paved road. Isn’t that an amazing statistic? So we were hiking in the mountains, and it was gorgeous and utopian. I really did have a sense that, except for the path at our feet, surely no human being had ever been in this place. And we got to our campsite, which was a lean-to, or a three-sided cabin with a roof, looking over the lake. It was gorgeous, except that right behind the lean-to was this dump for hikers who had been too lazy to pack out what they had packed in. At the time, I was even more goofily idealistic than I am now. As a kid, I was just flabbergasted. Who did they think was going to pick up after them? That question stayed with me, and I started to ask it in many other contexts. 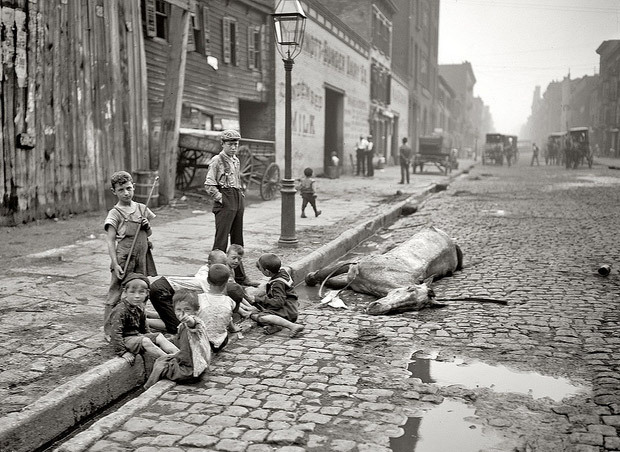 In New York at the end of the 19th century, it was not uncommon for dead animals to lie on the streets for weeks. 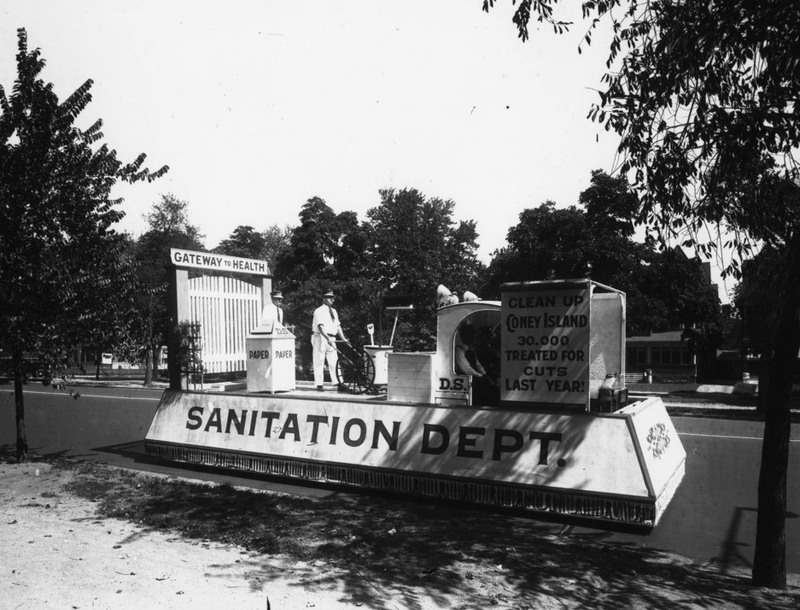 Collectors Weekly: When was the sanitation department established in New York? Nagle: It was created as the Department of Street Cleaning in 1881, and renamed the Department of Sanitation in 1929. But it was actually made effective for the first time in 1895, in that the people who worked for the department actually collected garbage and swept the streets. In its early days, the department didn’t really function at all. There are some photographs taken for Harper’s Weekly, before and after photos of street corners in New York in 1893 and then in 1895. And the before pictures are pretty astonishing, people were literally shin-high or knee-high in this muck that was a combination of street gunk, horse urine and manure, dead animals, food waste, and furniture crap. 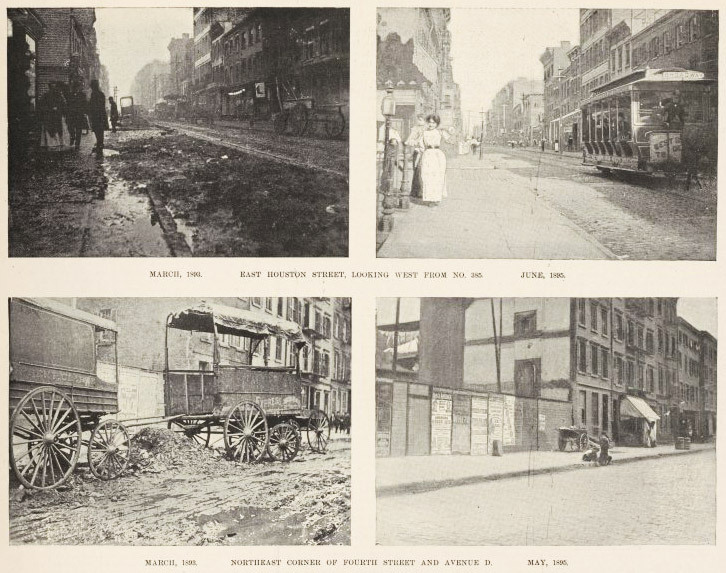 The June 22, 1895, edition of Harper’s Weekly compared photos of the same street corners two years earlier to show what an incredible transformation street cleaning had effected. Via the New York Public Library. Put yourself back in the late 19th century and think about the material world that would have surrounded you in your home. When you threw something out, it wouldn’t go anywhere. It would be thrown in the street. This was mostly because of corruption in the city government. It was a very easy source of plunder. The people in charge of street cleaning were in the pockets of people like Boss Tweed and Tammany Hall [a corrupt political group that controlled New York City’s Democratic party]. Other cities all over the world had figured out how to solve this waste problem decades earlier, but New York persisted in being infamously, disgustingly dirty. Collectors Weekly: When did the situation change? Nagle: There was a police corruption scandal in the early 1890s that was so spectacular the Tammany political machine could not control the reaction. So they were kicked out of office in the mayoral elections of 1894. A guy named William Strong took over as mayor, and he swore to appoint people of integrity as his commissioners. 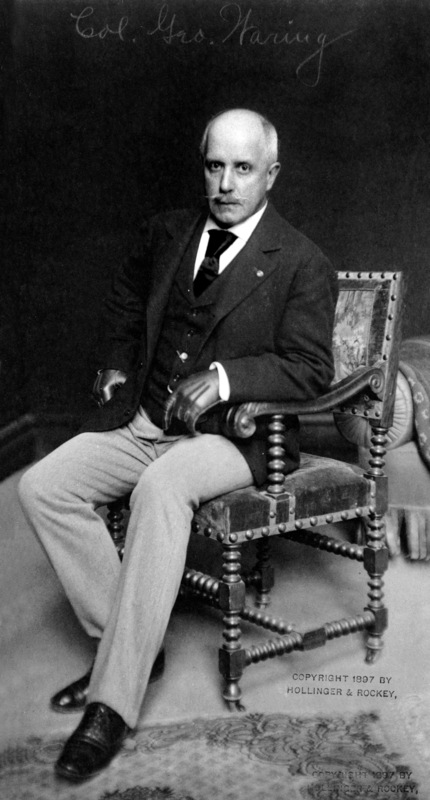 For street cleaning, he first reached out to Teddy Roosevelt, who basically said, ‘What, are you nuts? Nobody should do that. That’s an impossible job. I’m not going to do that.’ So Roosevelt took over the police department, which was also in dire need of reform. The dapper Civil War veteran George Waring described himself as a “sanitation engineer.” Photo courtesy DSNY. The mayor agreed and Waring immediately gave the department a hierarchical, military-type structure that is still in place today. This made people immediately responsible for very clearly defined tasks, like someone was assigned to sweep from this corner to that corner 10 blocks down, and they were going to do it inside these eight hours, and this cart was going to follow and the driver of the cart had these set hours. If there were any problems, the officer immediately in charge of that crew would have to answer for them, and then the officer above had to answer for the larger regional work. So Waring set that in place, and then he went after the filthiest corners of the whole city, which were the poorest neighborhoods, because wealthier districts had been hiring their own private cleaning companies for years. In the really poor corners of the city, like Five Points, to see anyone from the local government come into the neighborhood was not good news for local residents. They threw bricks at the street cleaners and came out to fight them with sticks. Waring said to his men, “You keep going back. You show them what we’re going to do and you see if you don’t change their hearts.” By the end of two weeks, he had tenements full of ardent fans because he cleaned their neighborhoods. Then he spread out from there, and he wasn’t afraid to fire people if they didn’t do their work. He said to everyone in the department, “You start with a clean slate with me. You work to keep your job.” He did truly creative things, like founding the Juvenile Leagues, so that children in public schools were taught to be eyes on the street for sanitation and law enforcement. Often these were kids whose parents spoke no English, so they were helping to inculturate an older generation with these new practices, teaching them that you don’t litter or throw your garbage on the street. There were more than a thousand of those groups over time. Waring also dressed the workers in white, and even his wife said, ‘What, are you crazy?’ But he wanted them to be associated with notions of hygiene. Of course, those in the medical profession wore white, and he understood, quite rightly, that it was an issue of public health and hygiene to keep the street clean. He also put them in the helmets that the police wore to signify authority, and they quickly were nicknamed the White Wings. 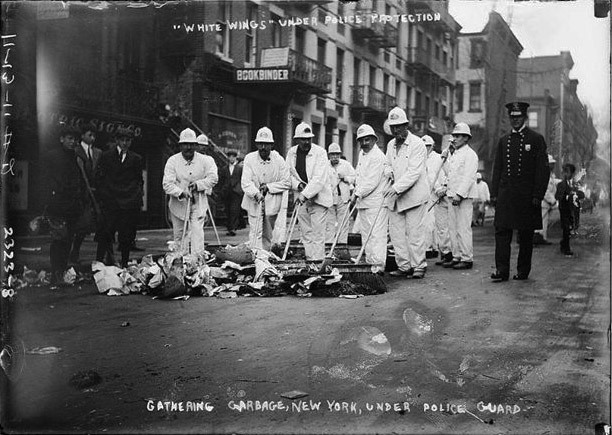 When Waring’s “White Wings” first began cleaning up New York streets in the 1890s, they needed police protection from disgruntled residents. Photo courtesy DSNY. These men became heroes because, for the first time in anyone’s memory, they actually cleaned the city. It was a very bright day in the history of the department. Waring was only in office for three years, but after he left, nobody could use the old excuses that Tammany had used to dodge the issue of waste management. They had always said it was too crowded, with too many diverse kinds of people, and never mind that London and Paris and Philadelphia and Boston cleaned their streets. New York was different and it just couldn’t be done. Waring proved them wrong. Rates of preventable disease went down. Mortality rates went down. It also had a ripple effect across all different areas of the city. Collectors Weekly: It’s interesting that sanitation was so publicly recognized, whereas today, the visibility of waste removal has greatly diminished. Nagle: The department of sanitation started out in the public eye because it was such a remarkable difference: The before and after was stark. We’re now very used to a certain presence and level of competence and waste management being very well done. One of the privileges of modern life is that we get to ignore it. Therefore, it’s almost like the department is a victim of its own success. 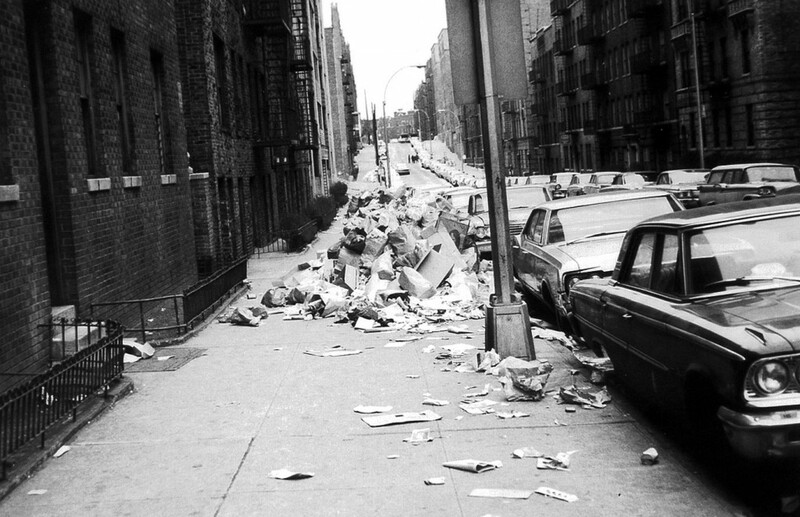 New York City sidewalks filled with trash during the 1968 strike, one of the few moments in the last century that garbage was front and center. Via Dennis Harper’s Flickr. Collectors Weekly: What was the role of women in New York’s early sanitation program? Nagle: Women were pivotal in the informal sector. There were two ways in which women were involved: Many privileged women made public hygiene, street cleanliness, and waste management their cause. Then at the other end of the spectrum, very poor women were on the street every day, scavenging and gleaning and surviving based on what they could pull off the streets. There were countless families who depended on women scavenging, and either selling what they found or bringing it home to eat. In Chicago, the reformer Jane Addams was the first commissioner of street cleaning, so she was part of its effort to formalize street cleaning work. But we had no female counterpart in the New York public eye. Waring was appointed in part because the Ladies’ Health Protective Association lobbied for his appointment. The Ladies, as I call them in the book, formed in the early 1880s to address issues of street cleanliness and public health. They worked as what we might call either an activist group or a lobbyist group, pressuring local politicians to address the problems. New Yorkers once took pride in sanitation, as evidenced by the department’s participation in many public parades and ceremonies. Above, a float from the 1940s. Photo courtesy DSNY. And they were smart. They picked very specific issues, like the gigantic dung heap somewhere in the ’40s on the East River. It created a horrific stench for anybody down wind of it. The pile was illegal, but it had been there for years and years. They owner sold it as fertilizer. It took them six years, but they managed to get it moved and the owner indicted. But generally, until 1986, women were only part of the formal work of solid waste management in small ways. Sanitation was the last of New York’s uniformed forces to integrate women, partly because they were under a hiring freeze from 1974 until 1986. Two women were hired off that very first wave of women applicants, and they both worked for 20 years. Collectors Weekly: How have the department’s goals shifted over the last century? New York’s Sanitation Department even produced its own quarterly magazine in the 1960s, called simply “Sweep.” Image courtesy DSNY. Nagle: The mission today, in a sense, is exactly the same as it’s always been—sweep the streets, collect the garbage, figure out how to pick it up and where to put it down. In a nutshell, that’s the job, plus plowing the snow, which has always been part of the department’s mandate. But it’s changed from a hundred years ago, in that now we have nowhere within the boundaries of New York to put down our trash. It has to go outside the city, which means we pay hundreds of millions of dollars to private companies to take our trash to other places. These other places include most of the states on the Eastern Seaboard and several in the Midwest. And that’s just New York City trash; that’s not the rest of the state. Every day, we generate 11,000 tons of garbage and 2,000 tons of recyclables, and that’s just household waste, which is roughly a third of the total trash output of the city on any given day. The other two categories are commercial, which is businesses and restaurants and whatnot, and then what’s called “C & D,” or construction and demolition debris. The New York City Department of Sanitation is responsible only for the household component of that. Sanitation is also supposed to be responsible for waste reduction overall, which is a little puzzling to me. To me, that’s a little bit like telling an undertaker he’s supposed to help lower disease and death rates. We’re responsible for the end product; we have nothing to do with the manufacturers and distributors and marketers nor are we holding the hands of the consumers who buy this stuff. But still, part of sanitation’s mandate is waste reduction. The entire effort of recycling is also an increasingly important part of what sanitation does. The politics of sanitation have become far more complex, partly because of important movements like environmental justice, which argues that communities of color or communities that are economically disadvantaged should not have to bear an unfair burden when waste management facilities are sited. Whether it’s a recycling materials drop-off or a waste transfer station or a sanitation garage or a compost facility, they shouldn’t be concentrated in any one neighborhood. Staten Island, which is the only reliably Republican borough of New York’s five boroughs, was host to the city’s only dump for many years. It’s largely white, and it’s largely middle class, but the residents claimed to be victims of environmental injustice. And they were right. It’s bigger than just class and race. The NIMBY, or “Not In My Back Yard” concept is huge now, all over the world. A view of Fresh Kills landfill on Staten Island, circa 1950. The dump ground closed in 2001. 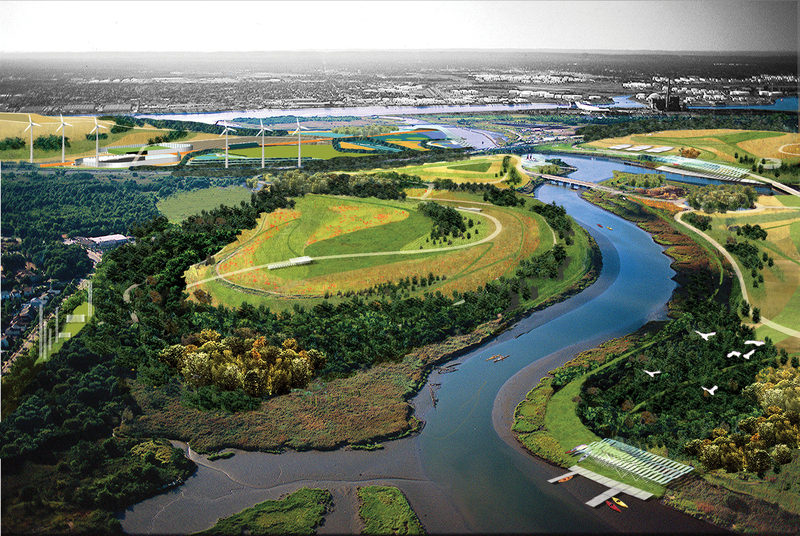 Collectors Weekly: Fresh Kills is the Staten Island dump you’re referring to? Nagle: Yes, but it’s now a remarkable park. Fresh Kills was one of many New York City landfills when it opened on April 19, 1948. There was also a network of incinerators in the city, but every landfill and incinerator was closed over time, so that by the early 1990s, Fresh Kills was the only option left. All of Manhattan’s trash was going out of the city by the time Fresh Kills closed in March of 2001. It was briefly reopened for September 11th material, and that effort was finished in August of 2002. And from that point forward, they’ve been turning it into a park, very thoughtfully, I might add. You can take your little kid there and not worry that he’s going to be eating garbage. It’s not open to the public yet, but they do tours. It’s breathtaking. You’re standing on some of the highest points within the city, and you’re surrounded by green. You see the city like a penciled sketch on the horizon, the oil refinery tanks across the water in New Jersey, and the suburbia of Staten Island. But while you’re actually in the park, you also see deer and hawks and all kinds of fascinating water creatures. It’s bucolic. And there’s no smell, unless you count wildflowers and sometimes that lovely, mucky smell at low tide that’s normal on any estuary. A rendering of the Fresh Kills Park project, currently underway on the site of New York City’s former Staten Island landfill. Collectors Weekly: How did garbage physically shape the development of New York? Nagle: Much of the city’s geography, in fact 20 percent of the larger metropolitan region, is built on landfill and much of that fill is varied forms of waste and garbage. Not all of it, but a lot of it, including incinerator ash and things like that. New York’s most prominent mid-century planner, Robert Moses, loved landfills and incinerators, partly because after 1934, we could no longer dump at sea. So he launched a very ambitious and very unsettling program to build incinerators and landfills. At one point, there were something like 89 incinerators and landfills all over the city. Once you get into the mid-20th century, it was no longer all organic, and you do find early plastics. 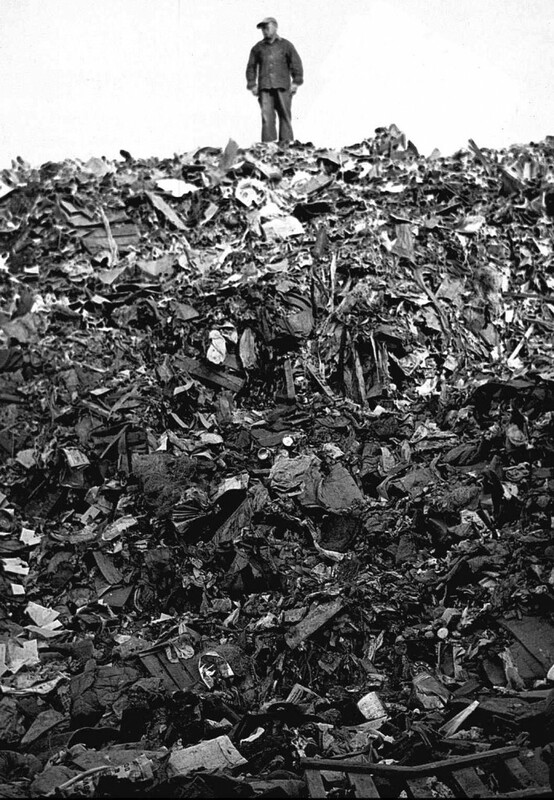 The technology of landfills back then was pretty crude compared to what we do today. The stuff in the bottom layers, there’s so much weight and pressure that there’s no space for any form of decomposition. So if you do a core sample, for instance, of Fresh Kills, which has been done and you pull up these early layers, you can still read the newspapers from that era. I’ve seen slide shows from archaeologists who’ve done this work and the hotdogs look like you could throw them on the grill. But they’re from the 1953 layer of Fresh Kills. So even the organics in there are not necessarily decomposing. And yes, in the upper layers, there’s stuff that will outlast us as a species, probably, by hundreds of thousands of years. 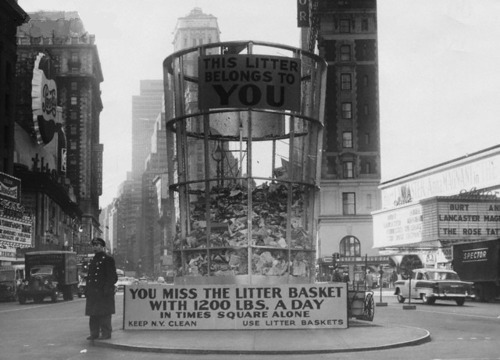 A mid-1950s campaign to prevent littering in New York included a gigantic waste basket in Times Square. Collectors Weekly: What would your Museum of Sanitation look like, and what do you hope the impact might be? Nagle: The museum will be a place where you walk in the door, and it’s bright. It might have truck components arranged in a way that looks like abstract art. I can see the backup lights doing a Morse code kind of rhythm, and trucks where kids can climb in, honk the horn, make the backup beeping noise, and run the cycle hopper. It would have temporary exhibitions that would tell the many stories about sanitation, about the workers themselves, about the politics of the job, about the corruption in the past, about the environmental impacts. The stories about how the Dutch built out from the shoreline, starting in the 1620s, with trash that is still excavated today. When they were building the World Trade Center, they found stuff from that era. There are ways in which our own history is with us all the time, right under foot, but we don’t know it because it’s literally buried. I also want it to be a community space so that groups can meet there for various causes, or maybe we can have a film festival of garbage-themed films. I want it to be a place where the department would use it freely. For example, the Pipe and Drum band members, maybe they’ll come there for their weekly practices. The other thing I want to have in the museum is what I call the Wall of Honor, which lists everyone who’s died on the job. 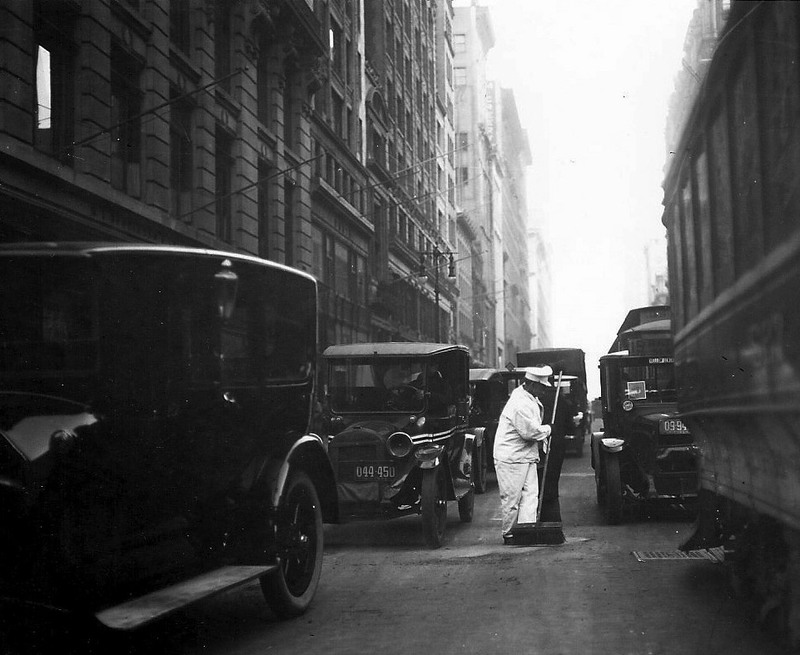 Street traffic has long been a serious danger to sanitation workers, like in this early 20th century photo. Photo courtesy DSNY. Collectors Weekly: What makes sanitation work so unsafe? Nagle: There are two primary sources of danger. One is that the stuff you toss in the back of the truck has a tendency to come shooting back out at you. If you get hit by that, you could be in trouble, because as you know, people throw out everything, even stuff that is supposed to be discarded in a more controlled context. So the trash itself is dangerous. For instance, a school bus has its blinking lights and stop sign, and if you go around a school bus that has its lights going, you will get slapped with a very fat ticket. But there are no hardwired protections built into our traffic system for garbage trucks. Collectors Weekly: Why don’t people know where their trash goes? Nagle: Well, are they aware of where their water comes from? Or where their electricity starts? Or where their computer components were made? We are profoundly connected across the globe to people we will never know, and we’re profoundly connected regionally by the path of our discards and the material flow of bringing those things into our life. But I think we’ve been taught to ignore those kinds of things. I don’t mean that we learned it in school, but as a cultural assumption that underlies contemporary life, those are not our concerns. 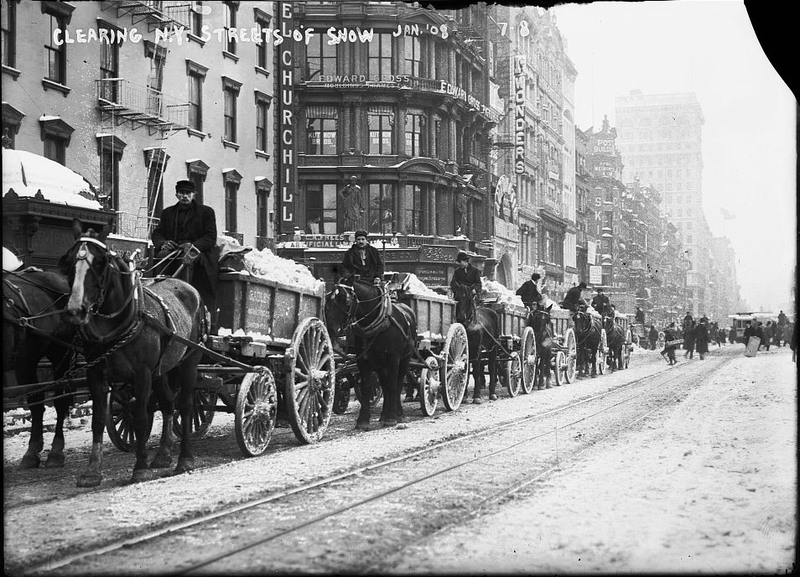 Since the late 19th century, snow removal has always been part of the sanitation department’s mission and is one of the job’s most visible duties. Photo courtesy DSNY. Collectors Weekly: Do you think this invisibility has an impact on how wasteful we are? Nagle: Sure. When I throw an object out, it still has a life, and it now activates this complex network of protocols and systems and controversies. But because we don’t have an awareness of this, it’s much easier to just let it go. In the case of, say, water bottles, what if a company that markets water in these plastic bottles was responsible for the end use of those bottles, after the water is gone. People are throwing them out their car windows, or letting them fall on the street, or putting them in our rivers and lakes. But the company would have to go and get all that stuff, and it would be a strong incentive to come up with an alternative, something that maybe isn’t a plastic water bottle. As long as we don’t look at the larger system, and let different industries foist off the long-term consequences of their manufacturing processes, as long as we let all of that be externalized, we are screwed, not to put too fine a spin on it. But we are also unaware, we meaning just the general public, the people at large. This is quite a heartbreak: People want to do the right thing. So do you tell them, recycle your water bottle and you will save the planet? No. If you recycle your water bottle, you have taken a very important first step, but that’s all it is. Then the question is, what are the next steps? How do we prevent this bottle from coming into being in the first place? Nagle believes a better connection to our garbage’s afterlife might help curb our monstrous waste. 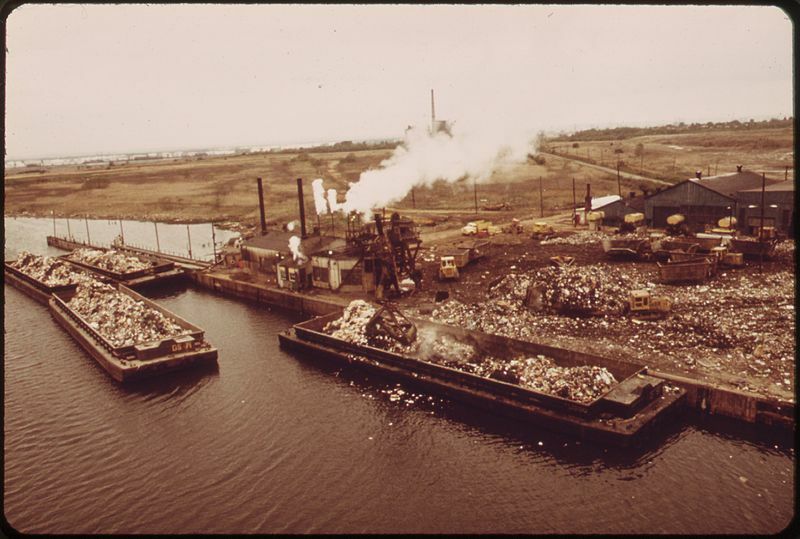 Above, barges transport waste to Fresh Kills in 1973. Collectors Weekly: How could people be made more aware of their own waste? Nagle: You know how there are nutrition labels on food? It would be fascinating if there were labels on every product we buy that told you exactly where each component in that product came from, what the energy cost to transport it was, what other wastes were created. It would be an interesting challenge to put that kind of infographic on the back of a shampoo bottle or something. At least that would let people make different kinds of choices, and begin to understand the life-cycle analysis of the consumer choices they make. Although, our individual consumer choices are still a tiny, tiny piece of the big picture. Municipal household waste accounts for three percent of the nation’s waste drain. We need to increase awareness of that statistic, and then shine a bright light on all of these other categories and the alternatives that could be proposed to prevent those streams. Collectors Weekly: What else can we do to bring positive attention to the importance of this job? Nagle: Just say, “Thank you.” When I started doing that on my own as my little private campaign several years ago, I was amazed at the reaction. The guys were astonished that anybody was bothering to say thank you. It’s one small gesture that an individual can make that honors them in a small, but real way. In terms of the bigger public issue, when cities talk about larger themes of city life like education and policing and environmental well-being, they need make sure whoever is in charge of the garbage is mentioned, and standing next to the mayor along with the police commissioner and in the headshot of the officials and woven into casual conversation from elected officials about important city infrastructure issues. Those are small things, but they make a big difference. Write letters to the editor, “Hey, I saw my sanitation guys today doing a fantastic job, just wanted to give them a shout-out.” They certainly get the letters when they aren’t doing a good job. 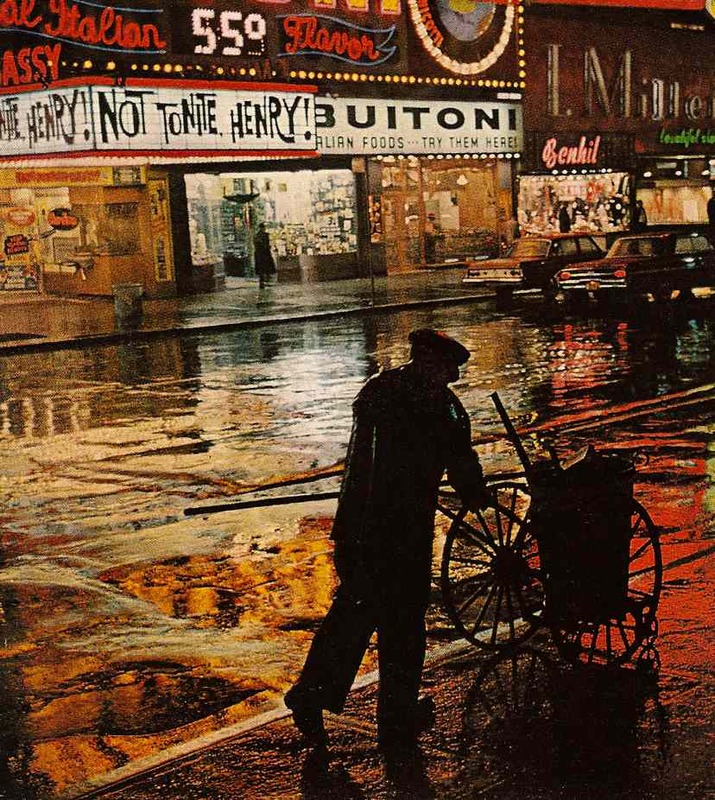 Sweeping in Times Square during the 1960s. Photo courtesy DSNY. I think maybe a quarter of my apartment’s furniture is stuff people were throwing out. Not to say the people throwing stuff out were wasteful. I understand when you move you can’t always take everything. But I wish more people were willing to take possession of stuff that others were throwing out that aren’t damaged or broken, simply stuff they can’t take with them upon moving. Wonderful article about Robin Nagle’s work. I have followed Robin’s work for years and applaud her for acknowledging the transformation of the how garbage is handled in NYC. Her writings are always well done and researched, and grasp the intricacies of Sanitation and how important a properly run agency is to the health of New Yorkers. I applaud her tenacity in keeping the discussion alive. Go to Freecycle.org and post either stuff that you want to get rid of (“Offer”) or stuff that you need (“Want”). It’s all above-board because it’s all by donation – they don’t allow sales. With over-sized things, it can even be easier than throwing stuff away because the person taking the item is responsible for transport. If you don’t accept, and explain trade-offs, but just try to reduce the amount of trash, you are not thinking like a rational adult. Love all of this! I’m a major waste-hater myself– even started a website, http://www.WeHateToWaste.com to bring together the best ideas from around the world for preventing waste in households. Also, I come from a long line of meatpurveyors in NYC. The meat packers used to all gang the bones and sell it to an org that would sell them for dogmeal; and the fat would be sent on freight cars to Cincinnati where it would be made into soap. So the notion of industrial ecology goes way back! I am very excited about the city getting into composting — because all of our food waste is really wasted in landfills — and creates methane too! Great article and photos. I totally agree with Robin that “a better connection to our garbage’s afterlife might help curb our monstrous waste.” Most of us are totally oblivious to where it goes, how it goes there, and whose life it impacts along the way or in the end. What I love is recycling paper to save the planet, while within 100 miles of where I am — and 150 miles of NYC — trees are being cut down and the logs (only the logs) being burnt to produce electricity to — well — save the planet. Wow, this is actually mind-blowing. It’s a bit disturbing though, and sort of shows a disconnect between what seems like it would be common sense, and what has to be forced into the mind. Why all the old photos? I bet you could take the subway through Brooklyn today and photograph even bigger piles of trash collecting on the rooftops. At least that’s how it looked last time I visited. If you want to see a clean place, check out Pasadena, they pressure-clean downtown EVERY NIGHT. Another wonderful law is the pooper scooper law. I grew up in NYC in the 50s & 60s and the smell of summer always had a good bit of dog doo. Now, even in August, the smell has gone. To Frank: People who run companies have families, drive in traffic, live in society, there are rules to follow when you are part of a system. With so much pressure on the environment, we have the duty to follow some rules which help improve every one’s lives. I can’t accept that individuals, no matter what they do for a living, are to be exempt from their responsibilities. I really liked the historical aspect of this interview. I was a little disappointed there was not more of an in depth discussion on the pros and cons of recycling. I think the Wikipedia page on recycling does a pretty good cost-benefit analysis. As someone who lives just outside of the Adirondack State Park, I found Robin’s opening remark amusing. The Adirondacks are entirely within New York State’s borders, which does not place them “outside of some parts of Maine.” Maine probably does include the easternmost point in the Continental United States where you can be 5 miles from a paved road, but it is not in the Adirondacks. I’m not sure whether she was confusing the Adirondacks with Maine or vice versa. Maybe, like most New York City dwellers, she sees anything north of New York City as “Upstate.” A vast area filled with inbred hicks, farms, wilderness, moose and foilage. (That last “Upstate” part in tongue in cheek). 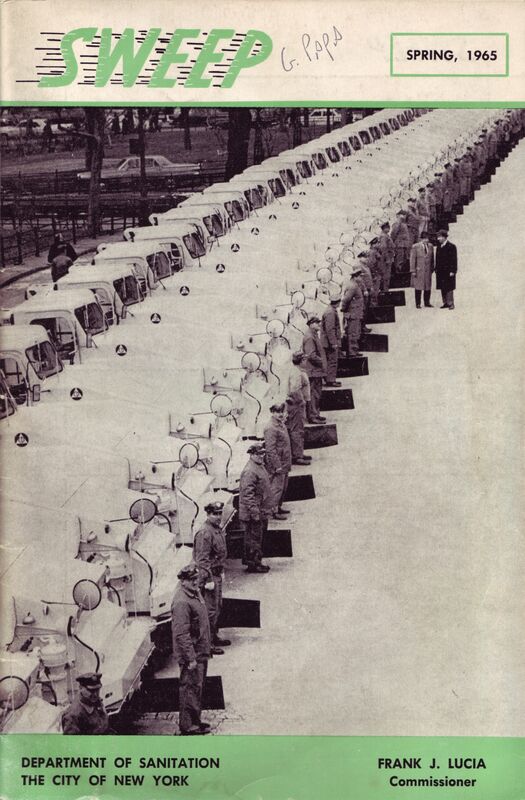 I love that the first sanitation workers wore white to signify hygiene. And yes, we are lucky that this job gets done without any thought from most of us. Thanking those that perform this thankless task, is the least we can do. I PICKED UP GARBAGE IN THE SAN FRANCISCO BAY AREA FOR 33 YEARS.NO AUTOMATION.PICKED AN CARRIED GARBAGE ON OUR BACKS IN 90 GALLON TRASH BARRELS (LARGE TRASH CANS) A VERY DANGEROUS AND STILL TO THIS DAY A THANKLESS JOB.MOST GARBAGEMEN I WORKED WITH , IF THEY MADE IT TO RETIREMENT, ARE CRIPPELED AND OR MAMED.SOME KILLED ON THE JOB BY EVERYDAY PEOPLE LATE FOR WORK AND WERE UPSET ABOUT THE GARBAGE TRUCK AND THE MEN WORKING THE STREET .PEOPLE STILL DON’T CARE ABOUT THE TRASH OR THE MEN WHO PICK IT UP, THEY JUST WANT IT GONE. I MADE A GREAT LIVING FOR MY FAMILY AND WOULD DO IT ALL OVER AGAIN.I MADE IT OUT ALIVE,RETIRED BUT CRIPPLED, BUT HAPPY. #13 Pickitup: I took the author’s phrasing to mean that, with the exception of some parts of Maine, the Adirondacks represent the last untrammeled wilderness on the East Coast. I did not read her sentence as situating the Adirondacks outside of Maine. I was employed by the n.y.c dept. of sanitation for 27 years. For three years of my tenure I worked at both fresh kills and the depts transfer stations. The majority of my employment was in household collection and operating mechanical sweepers threw out the city. My last 15 years was as a supervisor in Brooklyn n.y. I would like to thank your exhausted research and keen insight of how important and diffacult a profession these dedicated workers undertake on a daily bases. My memories could take me back to 1968 on the 12 to 8 shift in the south Bronx. Martin luther king had just been killed. Here I was a young 22 year old sweeping Debre ,when a large group of men started throwing bottles at our crew. I could recount many incidents of personal assaults,from bottles that were thrown at our crews. It was almost ear shattering when a passerby would say ” good morning” so to you thank you for your good wishes. I think the Bronx could use this today. I find it sad that the,early sanitation workers were in physical danger from the,local residents. That suggests to me that there was never a golden age in NYC during which people were safe. My wife and I crunched the numbers and maybe were at 7.1 pounds of trash per week not per day. I lost interest in the article at that point, since the number of 7.1 pounds per day seems exaggerated. Then I got to thinking about our Roof Replacement last year and just all construction that happens in the US in general, and I’m convinced, that’s where the vast majority of garbage weight is. I think (our) the US’s solution is in buying and using products that last and are not designed to break or wear out before they have to for the sake of someone else’s greed. Good article, but I question this assertion: “last place east of the Mississippi where you can be five miles from a paved road”. I’m certain there are places in the Adirondacks more than five miles from a paved road, I’ve been there!! Today in NYC, the trash walks upright and advocates ATM for 3rd grade education cirric. Hizhonnor being at the head of the line. I stopped reading at the “7.1lbs per day” part. I’m sorry but that is hogwash. .71 lbs is believable but 7.1 lbs of trash per person per day? BS! Unbelievable how much trash we make a day! “ ” Girls should be partners and comrades, rather than dolls.